The party is finally over, and I am in recovery mode. No kitchen work for me. Even baking some cookies doesn’t sound appealing right now. I know, isn’t that shocking? I never thought I’d reach this stage, but it has happened. Luckily, my friend Amy Jacobs stepped in to guest post a great looking- and totally creative!- cookie recipe. I got to know Amy through twitter. And with a handle like @I_am_cookielady I knew we would be great friends. I, after all, am known as the cookie girl! Amy runs a home baked cookie company called Cookie Comfort where she sells some delectable sounding cookies. For the bakers in the audience, please scroll down for a delicious sounding cookie recipe. I am totally intrigued by the flavor, and definitely plan to try these soon! For more updates from Amy (as well as -I hope- more amazing recipes) check out her blog here. It seems that my life revolves around cookies. That makes sense, given that I own Cookie Comfort, a cookie business that focuses on the nostalgic flavors of childhood cookies. My personal childhood cookie memories spans two continents. My mother’s kitchen was redolent with the smells of chocolate, sugar, and cinnamon. After-school snacks of chocolate chip, sugar or oatmeal cookies defined my school years. The other half of my cookie memories come from Tunisia, where my grandparents came from in 1964, with my mother and my uncle. Cookies didn’t really play a part my culinary heritage, with the exception of one kind of cookie. Unconventional by American standards, these cookies, called Ghreiba, melt in your mouth, leaving behind a subtle citrusy, nutty flavor. Growing up, I never had a peanut butter cookie. For some reason, my mother never made them. Knowing what peanut butter tasted like though, my brother and I thought the Ghreiba cookies were the Tunisian Peanut Butter Cookie. Imagine our surprise when we found out the main ingredients were chickpea flour and oil. Not a peanut in sight. Preheat the oven to 325 degrees F. In a bowl, combine the chickpea flour, all-purpose flour, sugar, vanilla sugar, salt and orange zest. Add the oil and margaine slowly and combine thoroughly. As soon as the dough comes together into a ball, it is ready. Divide into 16 equal balls and place on lined cookie sheet. Bake 20-23 minutes until lightly golden on the bottom. Let cool on racks for 10 minutes before transferring off baking sheet. For a gluten free version, use all chickpea flour. For a decorative touch, add almond slices to the top of unbaked cookies. For a sweeter cookie, roll in cinnamon sugar when cool. To store, place in a cookie tin. Cookies keep up to 4-6 days in an airtight container. Note: chickpea flour can be found in health food stores, middle eastern markets and indian markets. Its not a desperately hard ingredient to find, but you can walk by it if you aren’t looking for it. Sadaf and Bob’s Red Mill also make it. Bob’s may be more accessible. I can attest to the fact that these cookies are delicious! Thanks for the wonderful guest post from Amy. I hope you feel like baking again soon, in the meantime you have wonderful friends and Amy certainly provided a great guest post. What an interesting cookie! These look amazing. I love the idea of using chickpea flour. Oooooh, these sound good. 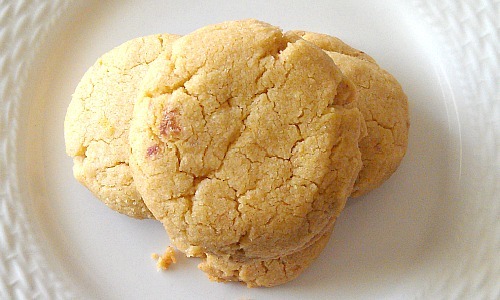 I absolutely adore chickpea flour – these must be tasty. One of the reasons I chose these cookies to share was because they are so good and unintimidating to a new baker. 7 or 8 ingredients and you are transported to a different country and a long ago era. Enjoy them. One of the reasons I chose this recipe was because it is such an unintimidating recipe for a new baker. 7 or 8 ingredients and you are transported to a different country to an era long ago. I never even knew chickpea flour existed. What an interesting find! Thank you. The eid is in 2 days so you can find them at any Tunisian Bakery or restaurant. My Tunisian mother in law makes ghreiban cookies and theyre delicious! Can i substitute the melted margerine for more oil? Instead of 3 tablespoons oil can i put 5 and omit margerine altogether? Do you think i will get the same result?